Click here for iFriendly audio. A proposal to replace the senior citizen sales tax exemption with a $300 rebate is dead. But a measure advanced by the Sitka Assembly last night would still change the exemption, making it available only to senior citizens with low incomes. The Assembly defines a low income as twice the federal poverty guidelines. For an individual in Sitka, that’s just under $29,000. For a married couple, just over $39,000. The measure advanced last night will also increase the age at which seniors qualify for the exemption from 65 to 67-and-a-half. That puts it in line with the federal government’s retirement age. Seniors must apply for the exemption, be a Sitka resident, swear to their age and residency, and allow city officials to have access to their tax return for proof. If approved, they would receive a photo ID card, which they’d be required to present when making any purchases. Thor Christianson sponsored the means test idea, along with Phyllis Hackett. Christianson said he preferred this plan to the notion of giving all seniors a rebate instead of an exemption. City Finance Director Jay Sweeney estimated the means test would bring about $400,000 into the city’s budget – about $100,000 more than what city officials estimated they could get out of the rebate program. But he also said that it would require more effort from city hall. Mayor Cheryl Westover, joining the meeting by phone, had the same concerns. 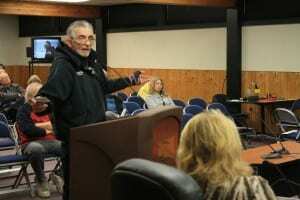 The Assembly amended the ordinance so it only applies to purchases “solely for the personal use or consumption of the Sitka senior resident,” and members of their household. Christianson says he put forward the means test to hopefully address the concerns of people like Ron Field, who often has lunch at Swan Lake Senior Center, where the exemption has been a topic of conversation. Field’s testimony came before the Assembly debated the sales tax measures. Because so many of the agenda items were related, Deputy Mayor Pete Esquiro asked for testimony on all of them on the outset. He received about an hours’ worth of comments from 17 people in Tuesday night’s relatively large audience. Tam Fondell, who runs Goldsmith Gallery with her husband Chris, said government should follow the lead of local businesses by scaling back when times are tight. City officials say even with extra revenue from changing the tax code, drastic cuts are still likely in the next year’s budget. The reason, they say, is a disappearing stream of federal money, along with the need to build up a fund to replace Sitka’s infrastructure. They say many of the roads and buildings initially paid for by grants during boom times are starting to fall apart, and that the city has no comprehensive way to cover the millions in repairs and replacements now becoming necessary. Listen to City Finance Director Jay Sweeney discuss the city’s financial situation, in an interview that aired Feb. 13. The changes to the senior citizen sales tax exemption won’t become final until two more readings. That gives the Assembly – and the public – two more chances to weigh in on the matter. The Assembly might have set a clear direction last night for the sales tax exemption, but plans to change the sales tax cap are much less clear. That’s because the meeting isn’t over yet. The Assembly called a recess when the clock hit 10:30, as required by city ordinance. When it did so, it was right in the middle of discussing a proposal to raise a cap on sales taxes. Right now, Sitkans only pay tax on the first $1,000 of any invoice. A proposal last night would have raised that to $5,000, but the Assembly got a lot of pushback from business owners. Eugene Solovyov is co-owner of the Sitka Rose Gallery. He said raising the cap will make it harder for businesses like his to sell big-ticket items to cruise visitors. Theresa Weiser, representing charter operators, also spoke out against raising the cap. She said there are a lot of factors working against the charter fleet, and this would be one more. Plus, she said a lot of reservations have been made already, at one price, and raising the cap would mean businesses would need to shell out the money from their own pockets. That concern was shared by Allen Marine, represented by Jamey Cagle and Dave Wolff. They said a lot of their cruises have been booked, and the July 1 effective date on the tax cap hike would complicate things, and cost them money. Wolff and Cagle also said the higher tax cap might force Allen Marine to base its Alaska Dream Cruises somewhere besides Sitka. Wolff is working as controller for Allen Marine, but prior to last spring, he was city finance director. He questioned whether there was any need to adjust the sales tax code at all. He pointed to a city balance sheet that has $10 million in unreserved funds in the general fund at the end of June 2011. After hearing from the charter operators, Allen Marine and other business owners, the Assembly decided to change the ordinance. Instead of raising the cap to $5,000, the language now calls for the cap to be set at $1,500. The Assembly called a recess before any votes could be held. Assembly members are scheduled to up where they left off tonight at 6 p.m. inside Centennial Hall.